Beavers are some of the most skillful tree fellers and dam builders on planet earth. 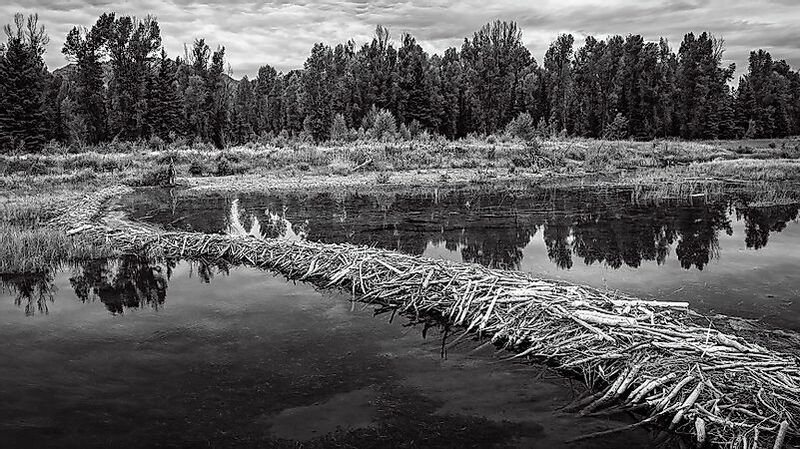 Beavers have skillfully inundated this land in the U.S. state of Wyoming. Known as “nature’s engineers”, the beavers, large nocturnal semi-aquatic rodents, are famous for their ability to build impressive dams known as beaver dams. These dams are built for serving a variety of purposes like keeping the beavers safe from predators like coyotes, bears and wolves and also for accessing food sources quickly and safely during winter time. Beavers also build lodges where they reside and water canals which they use to float their food and building materials. This ability of the beavers to adapt the environment based on their own needs is not seen anywhere else in the Animal Kingdom except, of course, in the case of man. Beavers building dams have often been photographed by researchers studying this interesting behavioral trait in these creatures. The beavers do not build dams in areas with fast, deep flowing rivers and streams but build dams in areas with shallow, slow flowing water to prevent the blockage of the underwater entrance to their lodges by ice in winter and also to create a water body with sufficient depth to hide themselves from their predators. The beavers first gnaw away at the barks of trees and branches near the river or stream to allow them to fall on the flowing water-body, blocking its flow and creating a diversion. This basic structure is then further strengthened by placing twigs, stones, leaves, branches, grasses, uprooted plants and anything else the beaver manages to find, on top of the base to build a superstructure. The beaver dams are usually 5 feet in height, a few feet to over 330 feet in length, and the water reservoir resulting from the dam is usually 1.2 to 1.8 meters in depth. Beaver dams have high ecological significance as they trigger the creation and development of stable, wetland ecosystems, one of the most productive ecosystems of the world, which serve as the home of rare and endangered flora and fauna species. The dams also divert water to the newly created ponds or reservoirs, thus, preventing flooding in areas downstream of the rivers where these dams are built. Beaver dams also protect land from soil erosion and act as natural filters for toxins like pesticides and silt, trapping these contaminants, blocking their flow downstream into major water bodies. Though beaver dams are ecologically significant, they might act as a nuisance in some cases when crop fields and pastures are destroyed by the flooding of water from these dams. The moisture retained in the soil near beaver dams might also weaken the underground foundations of roads, bridges, and railway tracks. Thus, often a need has been felt to control the construction of the beaver dams, especially in human inhabited areas, near agricultural fields and pasture lands. The beavers might be relocated from these areas to new areas where dam building would not pose a threat to humans. Special low voltage electric fences or other barriers might also be installed in human inhabited lands and waterways to restrict beavers from entering such territories. What Can We Learn From Beaver Architects? The small-scale dams of beavers can help us learn a lot about dam building, its advantages, and disadvantages. Beaver dams also allow us to study the gradual development of a rich wetland ecosystem in an area that was previously sparsely populated with wildlife. Unlike dams built by humans, most of which lead to widespread displacement of human populations and large-scale ecological damage, dams built by beavers have the exact opposite result of attracting species to inhabit the newly created wetlands. This fact definitely proves that nature’s own ways are always better than those of human beings. Did You Know That Some Primates Build Nests?